When Jen came to visit, I remember she was raving about the amount of Dear Mrs. Bird that she had gone through. We had an easy day during her visit, relaxing poolside with books and I remember at one point she excitedly looked up at me and said, “there’s been a bombing and I can’t talk to you now because I need to know what happens!” If any book can make Jen feel like that, I need to know more about it and then I need to share it with my readers! I’m so glad that Jen managed to get this review for me because I legit picked it up at my library the day after I got this review because Jen just made it seem that good! Dear Ms. Bird by AJ Pearce was a fantastic read and a good literary palate cleanser after a series of very overwhelming, dramatic, and sad books that I’ve read of late. I found this book to be particularly moving, heartfelt, and sincere. At first, when I was recommended this book, I thought it sounded a bit one-dimensional, but as I started reading, I was struck by how charming the story, the characters, and the history of this book all was. This book takes place during WWII London during the blitz and follows Emmeline Lake, or Emmy as her friends call her, who volunteers as a switch operator at the fire service and wants nothing more than to become a war correspondent. One day Emmy applies to a job posting at a newspaper. Due to a misunderstanding, she ends up working at a failing spinoff newspaper called Women’s Friend as an assistant to the advice columnist, Henrietta Bird. Despite feeling humiliated by the misunderstanding, Emmy decides to give it her best effort while she works towards her dream. As Emmy begins to dive in to her new job, she soon discovers that Mrs. Bird has very strict rules about which letters-to-readers she’ll actually answer - everything else gets cut up and thrown away. However, by turning down all these letters, the advice column can barely fill newspaper space, which makes Emmy realize why the paper is failing. Emmy reads a bag of letters every day, but can only deliver about dozen to Mrs. Bird. Emmy comes to think that perhaps the column isn't well-read because it doesn’t answer the questions people actually want to read about. One day, Emmy runs across a letter from a young teenager which reminds her of a childhood friend and she can’t bear to tear up the letter without helping. However, the writer didn’t provide a return address or stamp, meaning if Emmy really wants to help she’s going to have take drastic measures to print the advice in the paper without anyone noticing. Emmy discovers that she enjoys helping readers and perhaps there is as much honor in helping them as there is in reporting from the war. So begins Emmy’s adventure. As Emmy continues in her new job and volunteering for the fire service at night, she also writes letters to her boyfriend, Edmund, who is serving in the war. At first, she worries he will find her daft for the misunderstanding but as she begins to find new joy in her position, she hopes he’ll be proud of her. After months of no reply, Emmy discovers in his next letter that he is planning to marry a nurse he met while serving. At first, Emmy is sad, but when she recalls a letter from a reader, she realizes that it’s for the best. Perhaps they didn’t really love each other after all and if they’d stayed together they may have never realized that. Another way this story is unmistakably British is in how the characters flirt. Granted this could definitely be a generational thing rather than a geographical thing, but to me, their awkwardness and formality struck me as so British it hurt. At one point Emmy meets a new man who strikes her fancy and she goes out on a double date. Everything about this scene was filled with formality and forced casualness that I actually have a hard time believing there was a baby boom shortly after the war. Regardless, these scenes humanized the characters and helped make the setting of the novel feel more tangible. Every bomb dropped on London during the Blitz. Credit to The National Archives Image Library. As mentioned, this book takes place during WWII, specifically when the Germans were bombing London. This setting is handled like a character in itself and adds a sense of reality. Personally, I know I learned about the Blitz in school, I just don’t think it ever sunk in that the Germans were literally flying over London and dropping bombs on England’s most populated city. Credit: Imperial War Museum. A National Fire Service switchboard operator in action at the NFS London Region headquarters. 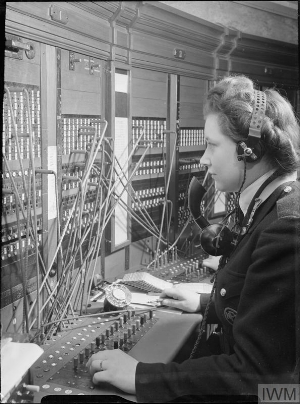 According to the original caption "This switchboard is the nerve centre through which the operations officer receives reports of fires and the progress of raiding and through which he issues his orders to the areas where the fire battle is being fought". I was surprised to learn about how the Blitz affected every aspect of the characters’ lives. For example, if it was a clear evening, they could assume there would be bombing. If there was going to be a visitor in the evening you had to answer the door with the lights turned out in case the light of your hallway provided a target. Sugar was luxury, and being happy and getting married were ways of doing your part to fight Hitler. Objectively, these were things I knew happened, but reading this book made these facts feel more real to me. The simple act of going out dancing with your friends could turn into a deadly adventure. Each character in this novel is depicted so carefully and richly that their individual quirks, plights, or successes feel more real. Additionally, each character has his or her own way to prove they are doing their part in the war. Mrs. Bird herself is never in the office because she is always hosting or volunteering at one function or another to raise funds for the war effort. Everyone who writes in to the column states they want to be strong to do their part for the country. The war is an ever-present force in their lives and no one is unaffected by it. Emmy’s way of sticking it to Hitler is to work as a switch operator answering calls from citizens who report bombings. Additionally, Emmy feels responsible to help the writers to Mrs. Bird who need a little guidance and are a little bit confused. Emmy finds that her own way to help the war effort is to help the advice seekers find solutions and know they aren’t alone. Without spoiling too much, all of this comes to a head for Emmy when she gets a letter from a writer who worries that her fear and nerves about the bombings means that she isn’t brave or strong enough to do her part. Emmy feels like just trying is enough and the fact that she is honest enough to write into Mrs. Bird is very brave. Emmy wants nothing more than to write back to the reader, but again as there is no return address or stamp, she’ll have to publish it in the paper. As her response is too long it definitely won't be unnoticed, leaving her with a decision to make. I was taken aback by the fact that some of the women in this book were supported by their families to work and live independently. Pursuing their dreams was progressive for most families. This story was surprisingly feminist but not in a brash way. Rather, it shows the readers Emmy’s honest desire to help. The author demonstrates how Emmy’s desire to help after a bombing might be difficult because she is a woman. If Emmy wants to pursue a job, the author illustrates how that’s a progressive act. I particularly enjoyed how Emmy found being honest with your feelings can be just as feminist or brave as going to war. In summary, I found this book to be a pleasure to read. I found myself tearing up during some particularly sad bits, but overall I would recommend this book to everyone. I not only enjoyed the characters and the story, but I also learned about the Blitz and women during WWII. I learned about a lot of good advice by proxy through the advice Emmy and Mrs. Bird gave out. I recommend this book because it is a heart-warming story and you will undoubtedly get something out it.